First Beru Khyentse Rinpoche, Karma Jamyang Khyentse Özer (Tib. ཀརྨ་འཇམ་དབྱངས་མཁྱེན་བརྩེའི་འོད་ཟེར, Wyl. 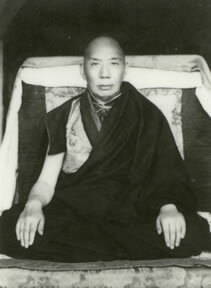 karma 'jam dbyangs mkhyen brtse'i 'od zer) (1896-1945) — the speech incarnation of Jamyang Khyentse Wangpo, born in Hor Tré Shö in Kham as the son of King Beru (Gönpo Düddul). The child was recognized by Jamgön Kongtrul Lodrö Thayé, who had predicted to his father, King Beru, that an emanation of Jamyang Khyentse Wangpo would be born as his son. He was later enthroned at Palpung Monastery, which would become the seat for all his activities. This page was last edited on 25 March 2011, at 07:18.